Do you recall this childhood playground song? In celebration of National Bean Day, take a minute to learn why you should be eating be ans. Although beans are not a fruit, they may be magical because they fit under not one, but two food groups. Within USDA’s MyPlate they are found under the vegetable and protein groups because they are so packed with vitamins, minerals, protein and fiber. Beans are a mature form of legumes. They include kidney beans, pinto beans, black beans, lima beans, and garbanzo beans (chickpeas). All are available in dry, canned, and frozen forms. These foods provide other nutrients such as iron and zinc and are excellent sources of plant protein. 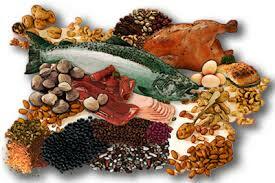 They are similar to meats, poultry, and fish in their contribution of these nutrients. Thus, they are considered part of the protein group. Many consider beans a vegetarian alternative for meat. However, they are also considered part of the vegetable group because they are excellent sources of dietary fiber and nutrients such as folate and potassium. The high nutrient content makes consuming beans recommended for everyone, including people who also eat meat, poultry, and fish regularly. The USDA classifies beans as a subgroup of the vegetable group. The USDA also indicates that beans may be counted as part of the protein group. This allows individuals to count beans as either a vegetable or a protein food. Beans are convenient and cost effective. They are available in the dry form in sealed bags and precooked in cans. A can of cooked dry beans can easily be used in dips, main dishes, soups, or salads. How do canned beans compare to dry-packaged beans? Canned beans are convenient since they don’t have to be presoaked and cooked. They can be eaten straight from the can or heated in recipes. According to the American Dry Bean Council, one 15-ounce can of beans equals one and one-half cups of cooked dry beans, drained. For most recipes, one form of beans can be substituted for the other. Unless canned without salt, precooked canned beans generally are higher in sodium than dry-packaged beans. Always thoroughly drain and rinse canned beans in a colander or strainer under cold running water before using them in a recipe. This may help lower the amount of sodium by 41% and may help remove some of their potential gas-producing properties. Beans are low in fat and calories and high in dietary fiber and protein. The fiber in beans provides a sense of fullness that helps keep food cravings down. Depending on the variety, a half cup of cooked dry beans is only about 120 calories. Because of their high fiber, low glycemic index, and high nutrient content, eating beans may help reduce the risk of diabetes, cardiovascular disease, and some cancers. dishes. Great northern beans and lentils are used in soups and stews. Garbonzo beans are used in salads and hummus. Check out these “no recipe required” bean meals and snacks. Beans aren’t just for baking at summer picnics anymore. Use this inexpensive, low-fat, high protein and high fiber food staple to make healthy alternatives to other fat laden salads and dips at your summer gatherings. Beans are so versatile, a half-cup serving of cooked dry beans counts as one, one-ounce serving of lean meat in the USDA Dietary Guidelines Meat and Beans group, and as a full serving of vegetables in the Vegetables group. The quality and digestibility of beans can be improved by consuming them with cereal grains. When beans and grains are served together in dishes like beans and rice, or tortillas and refried beans, they provide a complimentary protein profile. Make an easy bean dip by combining a can of any type of beans (rinsed and drained) with 1/3 cup of olive oil and process until smooth. Rinsing the beans helps remove some of the sodium. Season to taste with onions, garlic, or your favorite herb mix. Bring along baked tortilla scoops for the perfect appetizer. At only 100 to 120 calories per serving, beans are a great nutrient investment. The high fiber content of beans – about 25-30% of the recommended daily value per serving – slows the release of glucose and the increased satiety from beans may also enhance the effectiveness of weight-reducing diets. 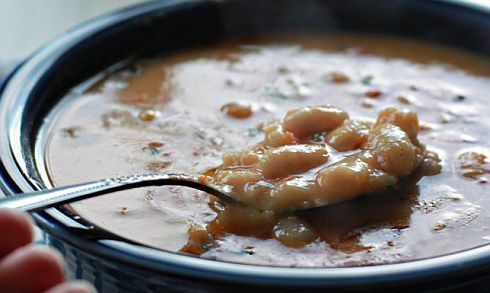 At about 20 cents per serving, beans do our wallets a favor as well. Add beans to your favorite salad to increase protein and fiber. Or, better yet, try an all bean salad. Drain, rinse and mix five cans of your favorite beans in a large bowl – try kidney, garbanzo, lima, navy, great northern, pinto and/or black beans. Add chopped onion, chopped green pepper and a can of rinsed and drained corn. Marinate overnight in ½ cup wine vinegar and ½ cup olive oil seasoned to taste with garlic powder, oregano, basil, rosemary and/or anise. This makes a delicious salad that can be served as a side dish or a dip for baked tortilla chips. Try something new this summer – bring on the beans! Writer: Polly Loy, Extension Educator, Family and Consumer Sciences, Belmont County, loy.1@osu.edu, Ohio State University Extension. Reviewer: Michelle Treber, Extension Educator, Family and Consumer Sciences, Pickaway County, Heart of Ohio EERA, treber.1@osu.edu, Ohio State University Extension.